Loosen radiator cap to prevent excessive water temperature build-up. Start engine and set speed at a minimum of 700 RPM. NOTE: A lower speed during warm-up will not provide proper circulation through the engine to uniformly stabilize the water temperature. Crank engine over slowly until distributor rotor indicates that affected 1951 Buick cylinder is in firing position, which places both lifters of this cylinder on the camshaft base circle (off the cam), so that either lifter may be adjusted. If oil groove on ball stud is not at least half down in rocker arm, turn ball stud down one additional turn (total 3 turns) and tighten rock nut. If oil groove is still too high, it will be necessary to install another push rod or lifter. Wash valve lifter parts in a suitable solvent to remove all traces of varnish or carbon. Carefully inspect surface of plunger and bore of body for scoring or other damage which would prevent free movement between these parts. If such damage exists the lifter assembly must be replaced. The assembly must be replaced if the lower end of body is worn, spalled (small nicks or indentations) or scored with scratched radial lines. CAUTION: On engines e quipped with hydraulic valve lifters it is extremely important to avoid getting dirt into these unit s. When removing and installing 1951 Buick cylinder head use ever y precaution to keep dirt out of the push rod compartment above the lifters. Drain cooling system and disconnect radiator thermostat housing from 1951 Buick cylinder head. Disconnect temperature gauge tube and rocker arm oil pipe from 1951 Buick cylinder head. Remove rocker arm cover then remove rocker arm, shaft, and bracket assembly. Lift out push rods. On some models it may be necessary to remove No. 16 push rod as cylinder head is removed. Slightly loosen all 1951 Buick cylinder head bolts, then remove bolts and lift off 1951 Buick cylinder head with manifolds attached. 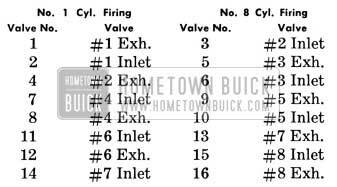 Installation of 1951 Buick cylinder head and gasket is the reverse of removal procedure, with attention being given to the following instructions. 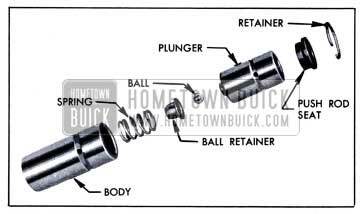 Before 1951 Buick cylinder head is installed, make certain that all dirt or carbon is blown out of the blind tapped bolt holes in 1951 Buick cylinder crankcase so that bolts may be fully tightened without bottoming in holes. 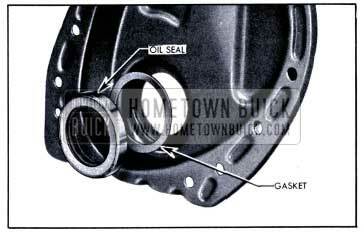 Examine gasket surfaces of cylinder block and head for nicks or burrs and for ridges around bolt holes. Dress off all high metal spots with a good mill file. Series 40 synchromesh engines use a Steelbestos cylinder head gasket .075 thick. Series 50 synchromesh and the Series 70 engines use a Steelbestos gasket .050″ thick. Series 40-50 Dynaflow engines use a lacquered steel cylinder head gasket .015″ thick. Use care when handling this gasket to prevent damage to the lacquered surface coat and to prevent kinking at the sealing rings stamped in gasket. The lacquered gasket should not be coated with any type of sealing material when installed. Always use a new steel gasket because the stamped sealing rings are flattened in a used gasket. 1951 Buick cylinder head bolt holes on manifold (left) side are open to water jacket; therefore bolts installed on this side should have threads coated with sealing compound to avoid water leaks. On Series 40 synchromesh engines (with adjustable valve lash) a baffle is attached by No. 1 rocker arm shaft bracket bolt and the oil inlet pipe extends down through a small hole in baffle. Always use an accurate torque wrench when tightening 1951 Buick cylinder head bolts, to insure uniform and proper torque on all bolts. Uneven or excessively tightened bolts may distort cylinder bores, causing compression loss and excessive oil consumption. A 3/4″ Wrench Attachment KMO 187-1 should be used with the torque wrench to properly tighten bolts located under the valve mechanism. See figure 2-16. Tighten 1951 Buick cylinder head bolts to 65-70 ft. lbs. torque following the sequence shown in figure 2-17. After installation of 1951 Buick cylinder head, particularly with the crimped steel gasket, tighten all bolts a little at a time in proper sequence about three times around before final tightening to 65-70 ft. lbs. torque. After the engine has been warmed up to operating temperature, recheck bolts and adjust torque as required. Before a new gasket is installed, scrape off all pieces of old gasket from 1951 Buick cylinder head, wash machined surface with suitable solvent and wipe it dry. The valve rocker arm cover gasket should be cemented to the 1951 Buick cylinder head instead of the cover. When gasket is cemented to the cover it is more easily damaged when removing or installing cover. Apply a heavy coat of thick gasket shellac or cement to gasket surface of 1951 Buick cylinder head, allow it to dry until quite tacky, then press gasket down evenly and in proper position on 1951 Buick cylinder head. Install rocker arm cover to hold gasket in place until cement is thoroughly dry. After removal of valves and springs from 1951 Buick cylinder head, scrape all carbon from combustion chambers and valves. If wire brushes are used for cleaning carbon, use care to avoid scratching valve seats and valve faces. Clean all carbon and gum deposits from valve guides. Cutting a valve seat results in lowering the valve spring pressure and increases the width of the seat. The nominal width of a valve seat is .062″ (1 1/6″). If valve seat is over5/64′ wide after truing, it should be narrowed by using the proper 20 degree and 70 degree cutters. If valve stem guides are worn to the extent that replacement is necessary, drive old guides out with Remover and Replacer J 269. When a new guide is driven into place from top side of 1951 Buick cylinder head the upper end of guide must extend 1 5/32″ above the top surface of 1951 Buick cylinder head. Replacement guides must be finish reamed after installation in 1951 Buick cylinder head. Use Valve Guide Reamer J 129-3 to provide .374″ to .375″ finished size in both inlet and exhaust guides. The rocker arms are mounted on a tubular steel shaft which is supported upon the 1951 Buick cylinder head by eight brackets attached by bolts and studs. 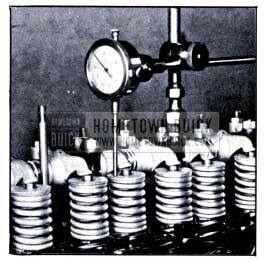 Springs placed around the shaft between adjacent rocker arms hold the arms in position against the brackets. The rocker arm at each end of shaft is held against the bracket by two flat washers with a spring washer between, and a cotter pin. The shaft is prevented from turning by a pilot screw in the second bracket. See figures 2-18 and 2-19. Adjust valves for .015″ road operating lash (par. 2-14), stop engine and turn until either No.2 or No.7 exhaust valve is fully closed. NOTE: It is advisable to remove flywheel lower housing so that engine can be turned very slowly by means of pinch bar applied to flywheel ring gear. Check the slack in timing chain. Initial slack in the timing chain when new allows 1/4″ to 3/4″ outward movement under finger pressure applied midway between points of contact with sprockets. Permissible slack in a worn chain can be as high as 1″ outward before it is necessary to replace the chain. Remove 1951 Buick camshaft sprocket which is attached to camshaft by a bolt, lockwasher and plain washer. 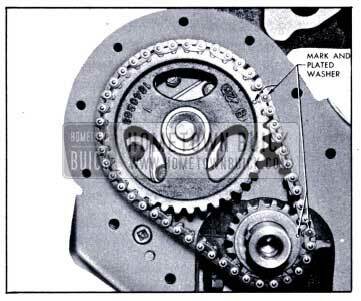 The sprocket drives camshaft through a key pressed into camshaft. Remove timing chain as sprocket is removed. Before installation of timing gear cover, coat rubber lip of oil seal with Standard Graphite Grease No. 4. When cover is installed make sure that the two dowel pins are in place in crankcase to properly locate cover so that the oil seal will be centered around the hub of crankshaft balancer. 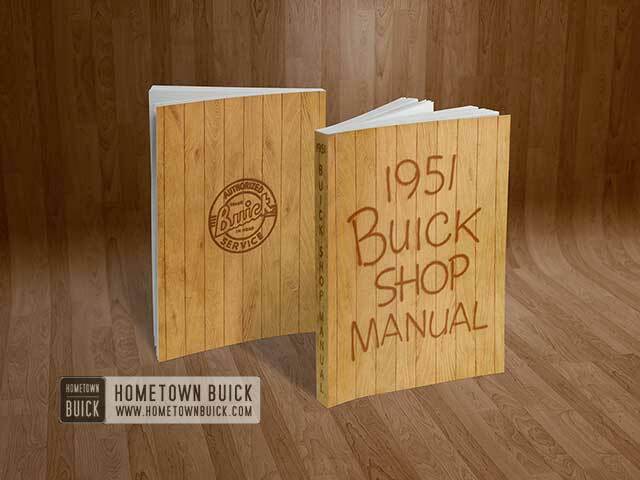 The 1951 Buick crankshaft oil seal is pressed into a recess in timing gear cover and a gasket is used to prevent leakage around the seal. See figure 2-22. The 1951 Buick camshaft is supported in five steel-backed babbitt-lined bearings which are pressed into the 1951 Buick cylinder crankcase. The camshaft bearings must be line reamed to size after being pressed into the crankcase. Since this operation requires special reaming equipment the original bearings should be retained unless severely damaged. Slightly scored camshaft bearings will be satisfactory if the surface of camshaft journals are polished and bearings are cleaned up to remove burrs, and the fit of shaft in bearings is free and within the clearance limits of .0015″ to .004″.